I’d read about this years ago and hadn’t heard about it again until today, but Alison Bechdel‘s graphic novel memoir Fun Home has been adapted into a musical by composer Jeanine Tesori and is now up at the Public Theater. Don’t know how I missed the premiere a full year ago, but better late than never… Here’s the latest New York Times review. 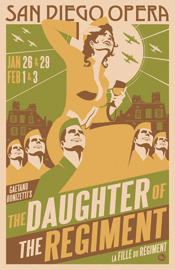 Sorta late on the bandwagon, but I’m loving San Diego Opera‘s posters for their 2013 season, created by a graphic artist more commonly associated with grassroots protest movements, R. Black. An outside-the-box collaboration that proved fruitful! There’s even a tenuous comics connection, since Dark Horse published a book of his work! Back to the opera, SDO doesn’t seem to be the most adventurous house as a whole, but they did present two pretty unique operas this season… One was Ildebrando Pizzetti‘s rarely heard 1958 Assassinio nella Cattedrale, based on T.S. Eliot‘s play on the 1170 assassination of Thomas Becket (aw yeah, medieval English history through an operatic Italian lens!). 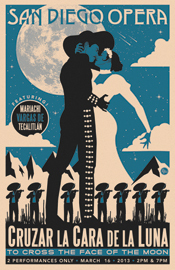 The other was the world’s first mariachi opera, Cruzar la Cara de la Luna by José Pepe Martínez, director of Mariachi Vargas since 1975. Both pretty rare, highly anticipated pieces, both well–reviewed. Despite their rarity, it’s now possible to hear them both on Spotify! Cruzar la Cara de la Luna was recorded at its Houston Grand Opera premiere, and the Pizzetti is represented by two recordings (I’d checked before, so these are new…). Mixing things up for Easter with a 20th century composition for the occasion. To follow today’s Studio YOLO post, let’s have another “variations on a theme“-themed day. The Prix de Rome was an annual award for French artists to study in Rome for a year first set up by Louis XIV in 1663(! ), though the award for composition only started in 1803, lasting 165 years until 1968. One of the tests for applicants was to set a chosen text to music. I was having a hard time finding multiple setting of any one text until I finally found two records of two settings of the 1901 text, Myrrha. First off is the winning composition by someone totally new to me, André Caplet, available on another Naxos CD of Prix de Rome cantatas by Caplet, Ravel, and Debussy, all part of the same turn-of-the-century artistic milieu. Ironically, the third place winner is much better known these days… Here is part of Maurice Ravel‘s setting of the same text, and a link to a second part. Reading lists of art award recipients years after the fact is always interesting… Makes you wonder how good time is at weeding out artists and how many people are unfairly neglected… I guess that’s why I like musical archaeology, rediscovering forgotten artists and fleshing out our understanding of their time period… ANYWAY. Enjoy your Sunday! Tonight I’ll be seeing the Met Opera premiere of Thomas Adès‘ The Tempest! I’m always curious about new opera, and though the Met hasn’t always had the most adventurous programming, I think they’ve been trying to branch out more lately. Here are a few reviews of the Met production, and even a Met Opera dedicated minisite. The premiere recording of The Tempest is actually up in full on Spotify, so if you don’t have Spotify yet, get on it! I actually saw A Quiet Place at New York City Opera a few seasons ago (a rare revival since its ’83 premiere), and it did suffer from a melodramatic, “very special episode” style in places. Bit awkward, but I guess they were a bit risqué thematically, so that could do it. I did like the way this aria opened the third act, though. EDIT: Ok, for anyone who can’t hear the above track through Spotify, here’s the opening of Trouble in Tahiti, Bernstein’s 1952 one-act opera that was ultimately folded in to A Quiet Place. They do say “morning” a few times in the jazzy opening number, so I guess that counts?